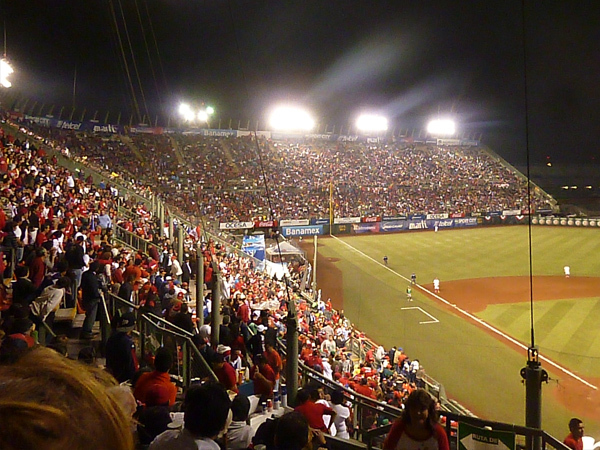 For sixty years, from 1940 to 2000, the Diablos Rojos del México played at Parque Delta (called Parque del Seguro Social for most of its life, from 1955-2000). Since then, the Diablos have played at Foro Sol, and Parque Delta has been a mall. 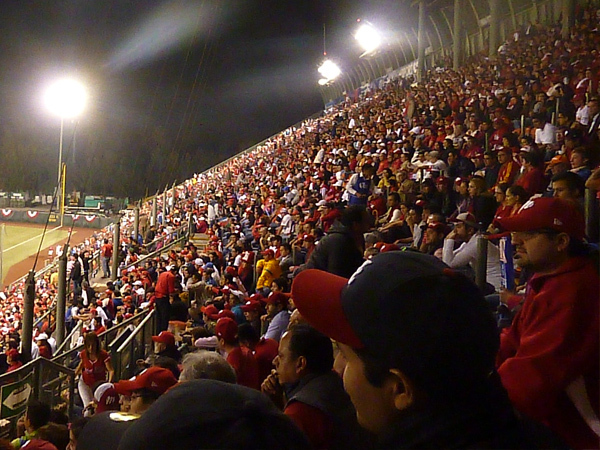 Last Thursday, Foro Sol hosted its last baseball game. Next year, Formula 1 is returning to Mexico City, and the racetrack that runs around the outside of Foro Sol needs renovating. I’m not entirely sure what is happening to Foro Sol, but I do know that the racetrack renovations mean that it won’t be baseball-sized, and won’t be the Diablos’ home anymore. Alfredo Harp Helú, the team owner (also part owner of the San Diego Padres), has said that there will be a new baseball-only stadium in 2016. This is excellent news. You will notice, though, that there’s a one-season gap between that last game at Foro Sol and the new stadium’s expected date. It was confirmed just a few days ago that the Diablos Rojos will be playing at a 3,000-capacity park just one subway station away called Estadio Fray Nano. 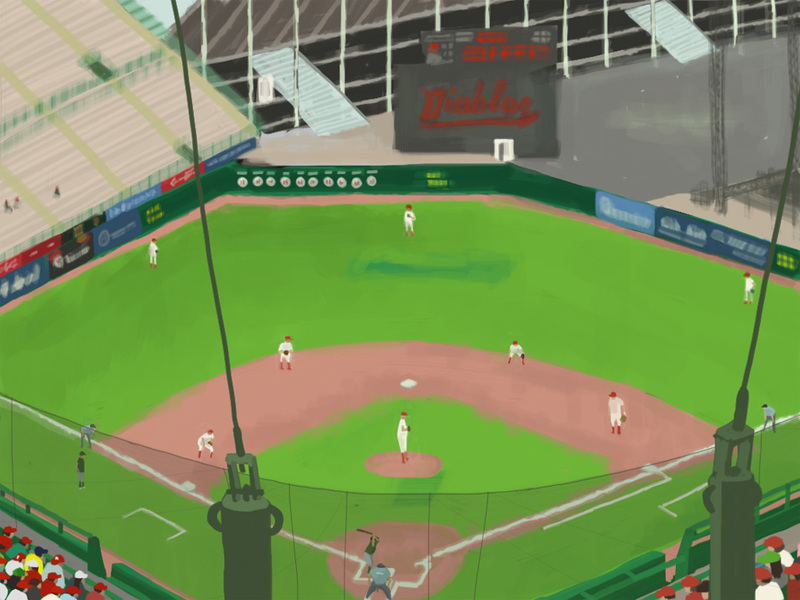 Last Thursday, at that last game at Foro Sol, the Diablos Rojos did something that has never happened in Major League Baseball: they won the championship. No team has ever won the World Series playing their last games in their stadium. (I hope I didn’t get that wrong, but I only spent about ten minutes on Wikipedia, so maybe…) That last game at Foro Sol saw my local team, the team I root for, win the Serie del Rey. It was wonderful. They had an early lead, then it was tied, then Pericos de Puebla took the lead in the top of the ninth, then the Diablos tied it in the bottom of the ninth, and won with a Juan Carlos Gamboa walk-off home run in the 10th. It was a wonderful season in general. The Diablos finished with the best record in the league (70-42, .625). They were particularly good at home (44-14, .759). In the playoffs, they beat Vaqueros de la Laguna 4-2, then swept Sultanes de Monterrey, and also swept Pericos in the Serie del Rey. They were unbeaten at home in the playoffs. It feels a little weird to be saying goodbye to a ballpark after it has been so good to the team this season. But, on Thursday, that’s what we all did. 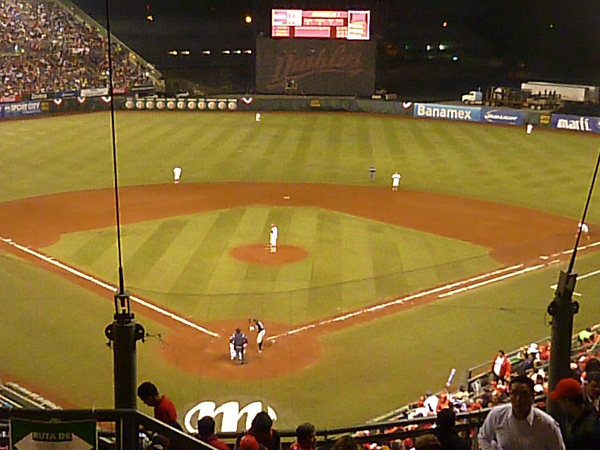 Foro Sol is, in all honesty, an ugly ballpark. Artificial turf, badly patched-up in places. Enormous concrete stands in the outfield that are mostly empty during the regular season. The stadium only has proper seats behind the infield. And if it rains–which it often does in the Mexico City summer–you’re getting drenched unless you are sitting high up above the infield. But A’s fans and Blue Jays fans might be able to relate to this: whatever the shortcomings of your stadium, it’s still your stadium. It’s home. I attended 97 games at Foro Sol. Outside of apartments I’ve lived in, I’ve been at Foro Sol more than any other place in Mexico City. It was ugly, but it was home. And a lot of why it felt like home wasn’t because of the baseball. It was everything else. It was the friendliness of other fans who would often engage in conversation with the weird English guy who was always there. It was the beer vendors who were always very chatty. Baseball is a minor sport in this soccer-obsessed city, and it almost feels like family when you see the same faces, have a chat with the guy who sells habas, say hi to taco guys, and at the end of the season, shake hands and hug those beer vendors: see you next season! It’s the fans who are the every game. The guy who always wears a luchador mask. It’s the group who sit out in the concrete bleachers and dance to almost every song that gets played over the speakers. The old fellas with battered cardigans, old satin Diablos jackets, and with plenty of dadhat going on. It’s the old woman who often sits a couple of rows behind me who hates the Diablos, but loves baseball, and since the Diablos’ biggest rivals Tigres left the city after the 2001 season and went to play in Puebla (they currently play in Cancún), she still comes to a lot of games, but roots against the Diablos. They wear black shirts with a red line through the Diablos logo on the back, kinda like a no smoking sign, and sit next to one of the Diablos porras and have a good bit of cheering and chanting back and forth. I love that they all seem to be friends. Indeed, you can tell which people aren’t Foro Sol regulars by how they react to the Porra de la República. Regular fans seem to enjoy it, give them a quick boo, and chant in return. Less regular attendees sometimes seem annoyed by their presence. For me, I love that they are there. I love that fans of other teams (mostly Tigres fans) still come and see Diablos games, just because they love baseball, and have found a fun way to be a part of it. The first game I attended at Foro Sol–back in 2008 when I was here on vacation–was a playoff game versus the Piratas de Campeche. It was the second game of the equivalent of the Division Series. It was my first Latin American baseball experience, and it was kinda fun to see the differences after spending the previous couple of months travelling around the States, visiting major league parks. 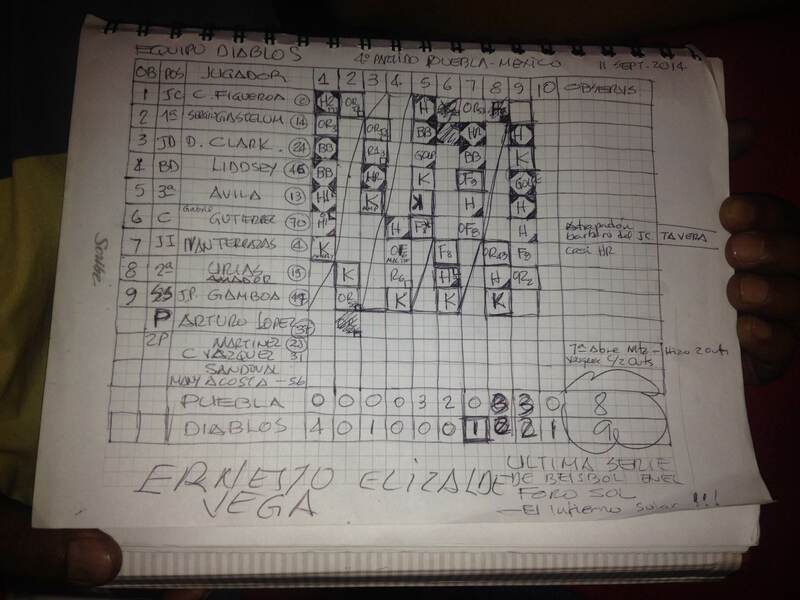 The Diablos won that series, and went on to win the Serie del Rey that season. Their catcher the day I saw them was former Padre, Mariner, Ranger, and Rockie, Miguel Ojeda. And now, in 2014, he has won a championship with the Diablos as their manager. It’s one of the things I love here: seeing former major leaguers play. Since I’ve lived here, we’ve had José Castillo, Óscar Robles, Luis Terrero, Mario Valdéz, Gerónimo Gil, Winston Abreu, Ben Broussard, Manny Acosta, and Dennys Reyes amongst others. This season, the Mexican League home run champ, with 33 homers in 372 at-bats, was the Diablos’ John Lindsey. Dodgers fans may remember he was a September call-up in 2010, when he played 11 games, and had a slash line of .083/.154/.083. Yes, the Mexican League is a step down from the majors, but how awesome must it be to have been a pro ballplayer for 20 seasons, to have had only the briefest of times in the majors, but in his age 37 season, win a championship and be the home run king? The Diablos Rojos and Mexican baseball have come to mean more to me than the leagues that goes on north of Mexico’s northern border. And Foro Sol has been where that has happened. It was ugly, but it was home. Next season Estadio Fray Nano will be home. Hopefully the Diablos can close out their time at that stadium with another title. And in 2016, we’ll have a brand spanking new stadium. The first night in a new apartment is always weird. You need to put some pictures on the wall, arrange what goes where in the kitchen cupboards, decide where the TV and couch will go, what sort of curtains will be best in the bedroom. But after a while, it’ll just stop feeling new. You don’t notice it: it’ll just be home. And that’s what we Diablos fans have got to look forward to. Adiós, Foro Sol, you’ve been fantastic. We hoped you liked reading Adiós, Foro Sol by Craig Robinson! I kind of wish this was posted in FanGraphs and not NotGrahps where it’ll get less play, because it’s a great read.